This apartment building overlooks Lake Merritt in the center of Oakland, CA, with an imposing presence and a view of the downtown skyscrapers. It is in a fast-appreciating area popular with young, professional tenants, a magnet for higher end retailers, trendy theaters and cafes, and walking distance to the jazz clubs downtown. New retail arrivals include Whole Foods and Trader Joe’s. Though well located, the building had much deferred maintenance, many vacant units, a poor entrance, no landscaping, outdated kitchens and baths. Rents were well under market when Drake acquired it in 2007. At that time, the City of Oakland rent control ordinances, properly implemented, allowed Drake to pass through the full costs of improvements to tenants over 5 years. This acted as an additional barrier to entry for new rental housing development, favoring re-positioning existing assets. As developers, Drake secured project funding, planned and managed the $1MM rehab construction, and directed the refinancing to take out the construction loan out one year after purchase. George Smith Partners of Los Angeles brought construction financing from China Trust Bank and takeout lending via Kinecta FCU. Refinancing appraisal valued the building as worth $2MM over cost which translates to a 100% return to our investors in one year. Fifty percent of equity was returned to investors on stabilization. Hercules Historic District was originally the site of the 19th century Hercules Powder Factory which supplied gunpowder for gold mining in the Sierras. The site was purposely selected by Hercules for its access to the Bay and safe distance from the City of San Francisco in case of explosion. By the 1980s, the plant had long been gone and the remaining buildings and homes had become dilapidated and damaged. The new City of Hercules approached Drake Property Group to undertake a restoration of the district based on Drake’s experience in preserving some of the first designated historical buildings in San Francisco. Drake reconstructed the original town plan, built new streets and sidewalks and moved 13 of the 20 buildings into their original in-filled pattern. The homes were lease-optioned for 5 years to capture an investment tax credit equaling 100% of investment. They were sold to individual buyers in 1989, subject to deed restrictions protecting their historic character from inappropriate alterations.This project was at the forefront of the new urbanism movement in the U.S.
Because of their quality and unique character the homes sold for a premium of 50% over the prices of newly built homes in the immediate area with 30% more floor area. Drake and Architectural Resources Group of San Francisco jointly received the Best in the West Award from the Pacific Coast Builders Conference and citations by the County of Contra Costa and the City of Hercules in recognition of their work. A partnership largely owned by the Principals of Drake purchased this multi-family building in Valley Village, close to the trendy NoHo district of Los Angeles. Art galleries, restaurants and shopping are all close by, with easy access to the major freeways. The Ventura Boulevard corridor is one of Drake’s favored markets for long term appreciation based on its strongly positive demographic trends. Los Angles County’s rent control regime exempts properties built after 1979. This creates a thirty-seven year span of well built and located core area properties which are becoming somewhat obsolescent and are readily re-positioned. Drake’s favored demographics respond very positively and pay a premium for good design. They value transit and locations that offer retail amenities. Drake built its acquisition and repositioning team in Los Angeles, developed relationships and skills in the local entitlements process, and held an asset that would earn a strong return in any possible condominium market downturn. This conservatism proved to be wise. Drake’s management team secured project funding, planned and obtained an approved Tentative Tract Map to convert the building to condominiums. Foreseeing the condominium market drop, Drake completed a light renovation, boosted rental income 20%, marketed the entitled property itself, selling for a record price due to current cash flow and future subdivision rights. The 43 unit apartment building in Denver’s Capitol Hill historic district required a full renovation of interior finishes to appeal to the increasingly educated and affluent tenant population who flocked to this urban core beginning in the 1980’s, at the time a B location. The property was sited in a rapidly improving submarket only blocks from downtown office complexes, restaurants and night life. Drake Property settled on a moderate cost repositioning program designed to appeal to young adults seeking urban chic ambience. The elegant simplicity of the result illustrated the impact that good but inexpensive design has in achieving higher rents, while building owner equity. The corner of 2nd and Military Avenues in the historic center of Benicia, California had been an eyesore astride the gateway to downtown. Working with the city staff, Drake Property Group developed and leased 20,000 sq. ft. of low visual impact and appropriately designed retail space, bringing new vitality to the central shopping district. Aegis / Drake retained architects with whom the principals had long experience in building Longs Drug Stores and created a private limited partnership to act as development partner. 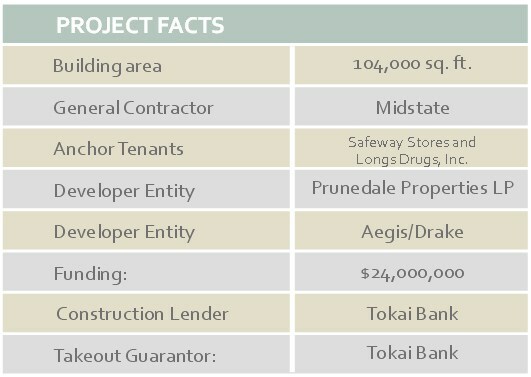 The project was partially pre-leased and financed with private equity and a construction / takeout first loan by Tokai Bank. The takeout component was triggered upon 80% lease-up achieved by month 10 and refinanced by month 12. The property was held as an investment for 3 years. The City of Prunedale, near Salinas, California was underserved in local shopping alternatives for its residents. 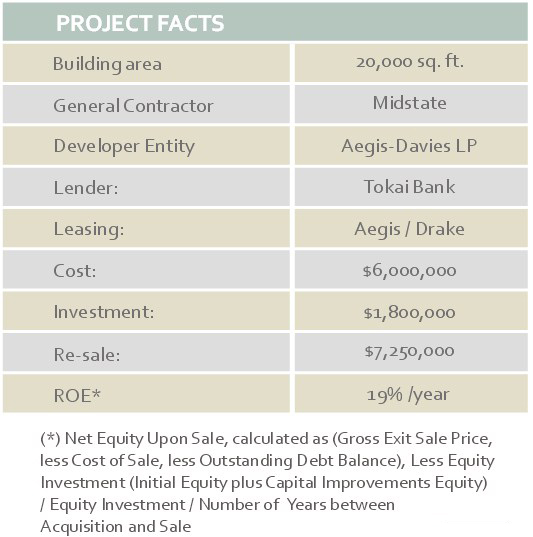 Drake Property Group undertook the basic market / demographic research to test the commercial viability of the project, planned and pre-leased the Center and managed its construction through final lease up in 1987. The site was particularly challenging in that it required construction of an interchange and access roads from Highway 156 and Hwy 101. Local environmental conditions required that the developer draw its water supply from some 400 feet below ground and undertake to elevate the grade on the west end of the Center approximately 30 feet over the existing grade. The Center was anchored by Safeway and Long’s Drugs and included 24,000 sq. ft. of retail shops. Drake Property Group worked with underwriters to structure unusual takeout financing based on a bond issue guaranteed by a letter of credit from a major overseas bank. Drake delivered a full service acquisition / construction / leasing and takeout package to the property owner, a passive investor. The Wadsworth Medical Building is a 60,000 sq. ft. multistory medical office building acquired by Drake Property Group in 1984. The building, well located adjacent to one of Denver’s largest hospital complexes, was obsolescent in both exterior and interior design and tenant service levels, particularly demanding and important in medical buildings, were inadequate. Offsite management was of indifferent quality. Tenant retention and lease rates had suffered. The property was well parked and had surplus land. Aegis / Drake Drake brought in its own project / property manager and retained the services of Neilson Design to bring a new look to the exterior and common areas, elevators, etc. The property was heavily renovated in a more modern design vernacular, re-leased on turnovers and returned to prominence as a hospital-oriented facility. The Wadsworth Project involved particular challenges in upgrading its complex utility systems to bring it up to modern standards.